Savior and Redeemer are names and titles of Jesus Christ. They describe what He has done for all of God’s children. Because of the Fall of Adam and Eve, everyone will experience physical death. When we die, our spirits and our bodies will be separated. When Jesus Christ was resurrected, His body and His spirit were reunited, never to be separated again. Because He did this, all of us will be resurrected. Jesus also paid the price for our sins so that, if we repent, we can be forgiven and live with Him and Heavenly Father again. This sacrifice is known as the Atonement of Jesus Christ. Because of His sacrifice, Jesus is our Savior and Redeemer. The Atonement is the greatest expression of Heavenly Father’s love for us. It is also the supreme expression of the Savior’s love for Heavenly Father and for each of us. This month’s scripture teaches about the Atonement and God’s great love for us. May your heart be filled with love and gratitude for God’s greatest gift to us: His Son, Jesus Christ. Read John 3:16 in the New Testament. Pray to know this scripture is true. Ask to feel God’s love for you. The Primary song “He Sent His Son” (Children’s Songbook, 34–35) teaches how Heavenly Father showed His love for us. Learn the song, and try to do what it says to show your love and gratitude for the Savior Jesus Christ. 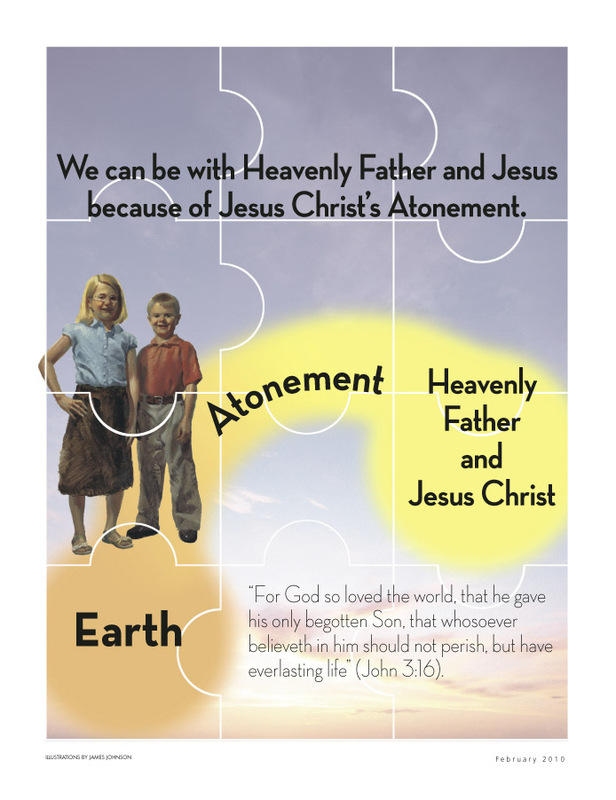 Cut out and build the puzzle (at right) that shows what the Atonement does for each of us. Share this with your family. How does what you have done help you understand this scripture? We can be with Heavenly Father and Jesus because of Jesus Christ’s Atonement.